It's way too easy to offend almost everyone nowadays. But apparently China isn't worried about rankling social media mavericks. They're keeping offensive, raunchy comedy alive and well this weekend with the import Fat Buddies. And any outrage that ignites on Twitter will only help fuel the desire to see these two beefy dudes taking on a drug cartel. The trailers and posters for Fat Buddies aren't provided in the English language. But the humor translates well enough. Let's face facts. Farts are hilarious in any language, as the teaser footage proves. 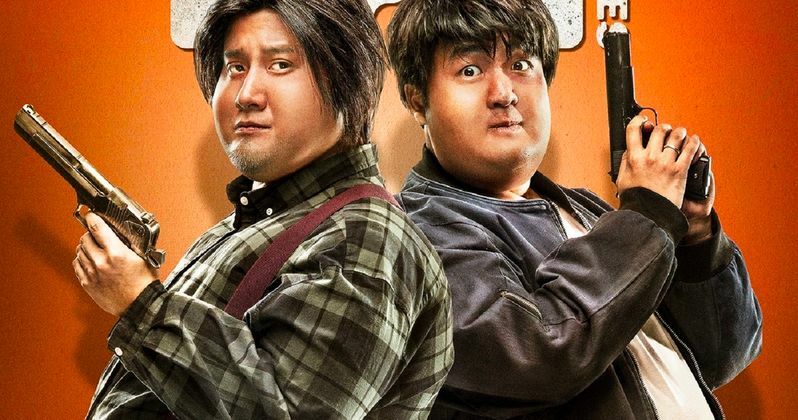 We're sure that, as more people 'catch wind' of this action comedy, there will be complains of fat shaming and skinny-washing, since the leads are obviously two fit dudes in fat suits. Bei-Er Bao is an audacious filmmaker who dares subvert the social media norms of what's executable and what's not. He's trying to remember an antiquated time when we could all laugh and mock each others shortcomings. And frankly, it's kind of refreshing. There doesn't seem to be any social commentary here. On the surface, at least. It's just good old fashioned slapstick. Remember when Eddie Murphy made The Nutty Professor? This will make you nostalgic for that era. Bei-Er Bao is an actor turned director who first cut his teeth in television, before making Fat Buddies his directorial debut. He is much better known on the other side of the camera, having racked up over 20 film credits as an actor. His movies have been popular in China, but there hasn't really been a crossover in the states. That could all change with Fat Buddies. The jokes are definitely weighted down with a lot of body humor. The joke is that these two big guys are able to thwart a drug cartel, something their smaller compatriots haven't accomplished. So maybe there is an uplifting message to be found here after all? Fat Buddies follows to bumbling cops with a love for hamburgers and donuts. They find themselves deeply embedded in a drug trafficking case. The movie is currently playing at various AMC theaters this weekend. Fat Buddies is the kind of comedy they don't make in Hollywood anymore. And any controversy surrounding it is questionable. If people start demanding an apology, does that mean Weird Al is going to have to bury his Fat video, which parodies Michael Jackson? Will Gwyneth Paltrow have to give her Oscar back for starring in Shallow Hal? Is any of this really funny? That? You'll have to decide for yourself as you watch the two trailers for Fat Buddies. It looks harmless enough, but perhaps it will genuinely hurt someone's feelings. Fat Buddies arrives from HK Films. If you're interested enough to check it out in theaters this weekend because Night School and Smallfoot just aren't doing it for you, chances are its playing somewhere close by. Now, whether or not it has subtitles? That's a different question.